Chelsa is a BJD made from Living Doll clay. She is 10 inches high and her clothes are not removable. Bella is not a BJD. She is sculpture and is in a permanent state. Glenda is made from Primier Clay over wire armature draped with various fabrics. She stands 16 inches tall. Sweet Pea is a OOAK doll Primier over wire. She stands 13 inches. All of these dolls are on ebay now for 7 days. I will consider any offer if reasonable. Enjoy watching them and have a happy week. I have doctors appointments this week for bone scans etc. Wish me well. Hopefully the cancer is not what they find. Nancye these are all SO tempting - wish I had more in my PP a/c at the moment. 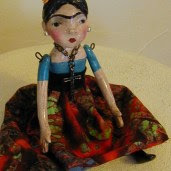 More GORGEOUS dolls you have created Nancye! You are in my prayers. The God of all strength is with you. I love this verse that you posted and your creations are wonderful. I especially like sweet pea.